The arrest of two Iranian women’s rights activists in the past week is part of a two-year crackdown that has already seen 34 women incarcerated in the country’s notorious Evin prison. Inside, purchase they are kept in one room and forced to sleep on the floor, click according to fellow campaigners. Prominent documentary filmmaker Mahnaz Mohammadi was arrested at her home in Tehran on Sunday and may have been seized by intelligence services, online according to the Los Angeles Times. She was previously arrested in 2009 at a cemetery in Tehran while laying a wreath at the grave of Neda Agha Soltan, the young woman who died after being shot during the 2009 demonstrations that followed the disputed re-election of President Mahmoud Ahmadinejad. Maryam Majd, (see WVoN story) a renowned photojournalist who campaigned for women to be allowed into football stadiums, was arrested last Friday. She is feared to have been held by security officials shortly before she was due to fly to Düsseldorf, Germany, to report on the Women’s World Cup. Their arrests are part of a wider campaign against the Green Movement and its potential allies that has been in operation since the protests of June 2009. Around 300 women are known to have been made political prisoners and 80 women’s rights activists have been arrested, according to women’s rights activist Mahboubeh Abbasgholizadeh. Both women are believed to be being held in Evin prison, where 34 activists are already held in a single room. Among them are student activist Bahareh Hedayat and human rights lawyer Nasrin Sotoudeh. In the wake of protests against the re-election of President Mahmoud Ahmadinejad two years ago, the length of sentences handed down has increased significantly. Instead of months, as was the case before, the shortest prison sentence has been six years, while the journalist Jila Baniyaghoub has been banned from pursuing journalism for 30 years. 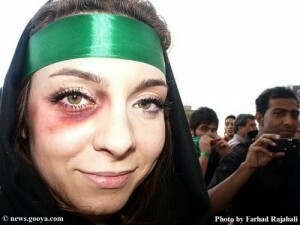 Abbasgholizadeh said the women have been accused of being “a threat to national security”. “The regime targets activists from all spheres who can in some way keep social movements alive. The regime does not want the Green Movement to benefit from any other movements.